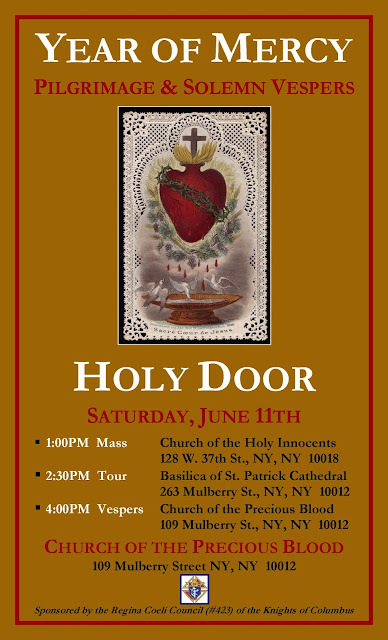 This coming Saturday, June 11, 2016 (immediately after the 1 p.m. traditional Mass at the Church of the Holy Innocents in New York City), a group of parishioners will go pilgrimage to St. Patrick’s Old Cathedral where they will be received by the Rector, Msgr. Donald Sakano. Once there, the parishioners will get a tour of the recent renovations and be led in prayer for the Year of Mercy. If time allows, there will also be a tour of the catacombs/underground cemetery. The parishioners will be there from 2:30 p.m. until about 3:30 p.m. The group will then depart for to the Church of the Most Precious Blood where the Holy Doors of Mercy are located for those who want to obtain the plenary indulgences. If time allows, there will also be an explanation of the Neapolitan presepio (manger scene) that is now at the Shrine Church of the Most Precious Blood. Finally, at 4 p.m., newly-ordained Fr. Jon Tveit will celebrate traditional 1st Vespers of the 4th Sunday after Pentecost at the Shrine Church of the Most Precious Blood. If you are interested in attending, please let Mr. Eddy Toribio know (eddy@holy-innocents.com). For more information on the requirements to obtain the plenary indulgence, please go here: http://oldcathedral.org/extraordinary-jubilee-year-of-mercy.